I am going to get right to the point and tell you that these gluten-free Powdered Sugar Donut Muffins don’t disappoint! That’s just in case you’re about ready to scroll down to the recipe. These donut muffins are the easy-to-make and every-bit-as-good, gluten-free equivalent of those little white powdered sugar donuts from back in the day. You know those little white donut treats we enjoyed before we went gluten free? Remember those? Mr. GFE and I used to always take Hostess donuts on our camping trips. Sometimes we took a bag of the mini donuts, what Hostess calls “Donettes.” And, honestly, we have occasionally missed those little treats over the years since I went gluten free. Mr. GFE will sometimes buy an individual package of mini donuts for himself, but they’re not the same. When I got a chance to review Elizabeth Barbone’s How to Cook Gluten Free: Over 150 Recipes That Really Work a good while back, I was so happy to see her Powdered Sugar Donut Muffins recipe. Recently I was reminded of them and made them again. I had forgotten just how good they are. Honestly, they are a delight! Not only do they taste great—truly just like those gluten-full powdered sugar donuts we can no longer have—but they also don’t require any special ingredients and can easily be made in 30 minutes. Bonus … because they’re muffins—mini muffins, to be exact—you don’t have to actually make donuts with this recipe! Don’t you love them already? That also meant that you don’t even need a donut pan. You simply need a mini muffin pan. Any size mini muffin pan will work, but I like this size and this pan. If you look closely at the photo above, you’ll see two different sizes of mini muffins because I had to use two different pans. This recipe makes that many donut muffins—yippee! You also might have noticed that my donut muffins are not completely “snow white” in color. That’s because I used far less powdered sugar than what is stated in the recipe. We all know that donuts didn’t get their nickname “sugar bombs” by accident. They’ve earned that name and even when they’re an occasional treat for us, I like to reduce the sugar a bit if I can. When made this way, these donuts still have lots of visual appeal and are still plenty sweet, but not nearly as much powdered sugar is needed. 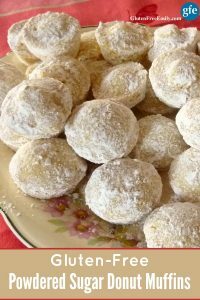 Originally this gluten-free Powdered Sugar Donut Muffins recipe was shared in the same post as Elizabeth’s Upstate Goulash (another great recipe!) but it kind of got lost there. Plus, it needed a new photo. That’s why I’m giving this recipe its own post now. I think you’ll love these donut muffins and will want to make them again and again! I love that the recipe makes so many. We enjoyed the last batch for days. Mr. GFE especially loved them in his lunch box for his mid-morning snack break. Enjoy! These gluten-free Powdered Sugar Donut Muffins are the gluten-free version of those tasty Hostess Donuts, sometimes called Donettes. These are easy to make and every bit as good as those original little snowy white powdered sugar donuts. Great for breakfast or packing in lunches for treats. Preheat the oven to 350ºF. Lightly grease the cavities of a mini muffin pan with nonstick cooking spray. In a medium bowl, whisk together the dry ingredients (except for powdered sugar). Add the wet ingredients and whisk to combine. The batter will be thin. Fill the muffin cavities about half to three-quarters full. Bake for 15 to 25 minutes, until the muffins are golden brown. While the muffins are baking, fill a large bowl or 8-inch square baking dish with the powdered sugar. Remove the muffins from the oven and working in batches, place them directly into the powdered sugar. Gently roll the muffins in the sugar to cover them. The steam from the hot muffins will make the sugar stick to the muffins. Remove the muffins from the sugar and tap off any excess. Transfer the muffins to a wire rack to cool. Store in an airtight container for up to 3 days or freeze for up to 1 month. I used 1 ½ cups of my Two-Ingredient Gluten-Free Flour Mix to replace the individual flours and starches. I omitted the nutmeg. Personally, I love nutmeg in a limited number of recipes, but prefer cinnamon in others. I’ve both used cinnamon in this recipe and left it out. Either option works fine. 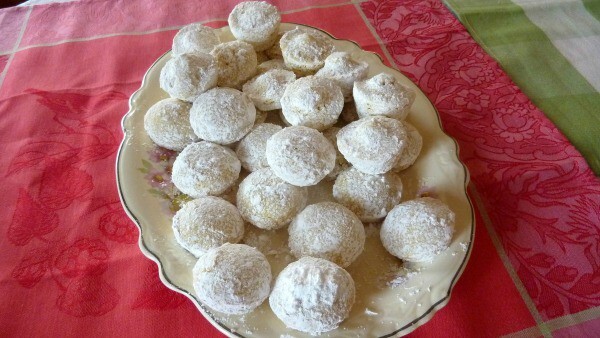 While the original recipe called for a whole box of powdered sugar, I used far, far less. Maybe about ¾ cup to 1 cup. As a result, my donut muffins are not perfectly “snow white,” but they are still plenty sweet. Be sure to sift your powdered sugar. 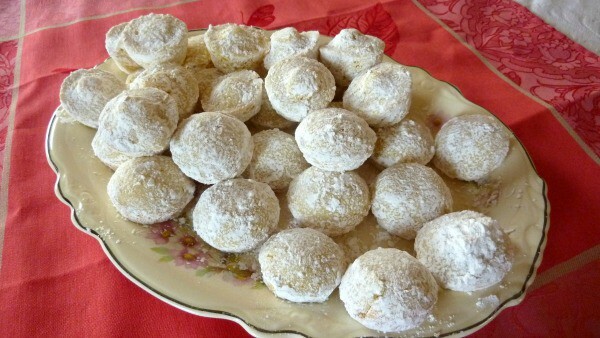 There will be no clumping and the powdered sugar will stick much better, which results in a nicer presentation. Recipe reprinted with permission from Elizabeth Barbone and Fair Isle Press. Looking for More Gluten-Free Donut/Doughnut Recipes? What a great recipe. No one has to feel deprived being gluten free. I never cared for this type of donut at all. Never could stand that dry sugar in my mouth. HA!! I know some people in the family that eat GF would probably really like these. Thanks for all you do to help the ones that have to eat GF. Hey Charlotte!–Well, everyone has their own preferences, of course. 😉 Yes, I’m sure you know some folks who will enjoy these gf “donettes. I’m always happy to help, of course! Stopping by from April’s party =) Pinned your scrumptious looking donuts. I adore little donuts like this, Shirley! I’m so glad you’ve shared this wonderful recipe with us at Hearth and Soul. It’s lovely that they are baked as well! Thanks for hosting Hearth and Soul and for sharing with folks!